Match.com, an operating business of IAC (Nasdaq: IACI), today announced an agreement by which Match.com will become the exclusive online dating site on Yahoo!. Yahoo! Personals users will have the opportunity to move to a new co-branded Match.com experience, “Match.com on Yahoo!” where they will combine with the greater Match.com community. The Match.com on Yahoo! service is available starting today. Yahoo! Personals users will receive special offers designed to help them enjoy all that Match.com has to offer. 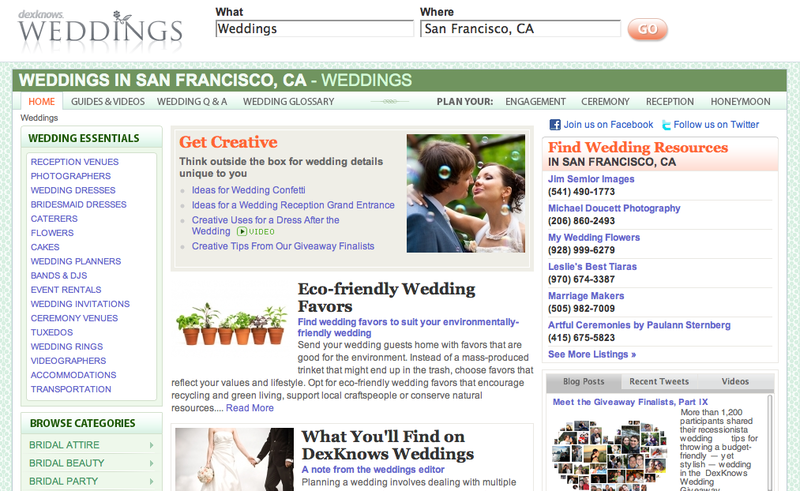 The two companies are working together to help users easily migrate to Match.com on Yahoo!. Over the next two months, existing Yahoo! Personals members will be given the opportunity to seamlessly migrate their Yahoo! Personals accounts over to the new experience. Match.com on Yahoo! offers compelling features including mobile access, daily personalized matches and robust search tools and will fully replace the existing Yahoo! Personals experience at the end of the transition period. This is now part of a pattern that includes search, shopping and other verticals. In a way its smart: pick the best-of-breed partner and then let them worry about product development. It’s part of an overall cost-containment strategy. Yahoo! gets the content without the engineering costs. The company has decided there are a number of strategic areas that it needs to keep in house: news, sports, finance, among a few others. I believe that Local is also on that list. Yahoo! is entering into a partnership with leading media and marketing services company Valassis. The partnership will expand the online advertising options available to Valassis’ clients, providing them with Yahoo!’s customized targeting solutions for reaching the right customers in their communities. Valassis’ clients will further benefit from the ability to access premium online display advertising inventory from Yahoo! The partnership is a key component of Yahoo!’s greater strategy of working with local partners to help them reinvent their business and provide them with the tools they need to maximize their online spend. Selected from more than 1,000 entries, the finalists are comprised of brides and grooms seeking to win $10,000 by sharing how they plan to keep wedding costs low without sacrificing style and quality. Now it’s up to the public to select the final four couples who will take home $10,000 apiece. Public voting is taking place from now until May 28, 2010 on the DexKnows Weddings website and on the site’s Facebook fan page. Winners will be announced June 2, 2010. 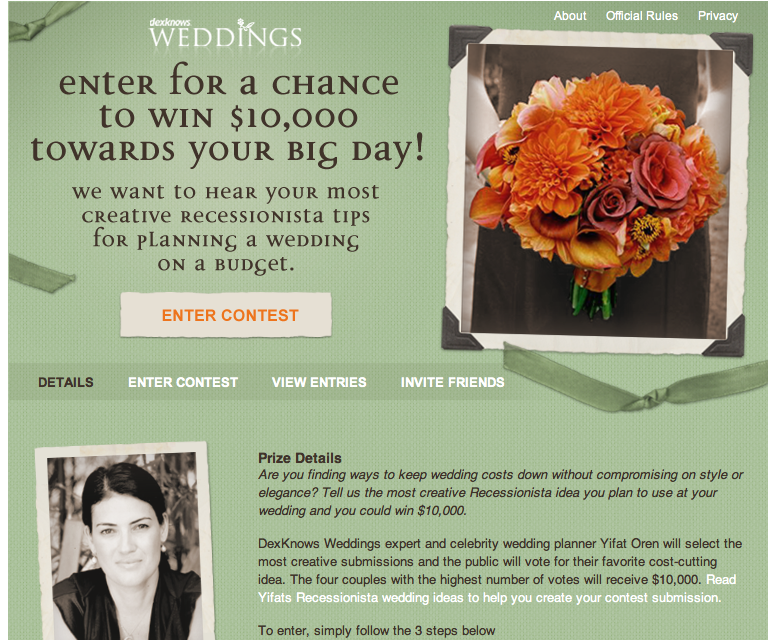 Celebrity wedding planner Yifat Oren — who has produced weddings for Kevin Costner, Mariska Hargitay, and Jason Bateman, among other high-profile clients – selected the finalists based on their creativity and inspiring alternatives to traditional and often costly wedding items. It’s a smart idea and way to promote the site. Next up, a reality TV show? Publicly traded OpenTable has been the Microsoft of restaurant bookings, a proprietary hardware-software inventory management solution with Cadillac fees and effectively without competition for the better part of the last decade. The company has a market cap of almost a billion dollars. That was the beginning of an elaborate post I was going to do on Urbanspoon’s new “Rez” challenger to OpenTable. But the Wall Street Journal “broke the embargo” last night and then everyone piled on. You can read all the competing stories here. Fees for Rez (to the restaurant) are $99 per month plus a dollar per “head” per reservation. This includes new customers and repeat business. Urbanspoon/IAC won’t charge if the reservation comes from the restaurant’s own website however. 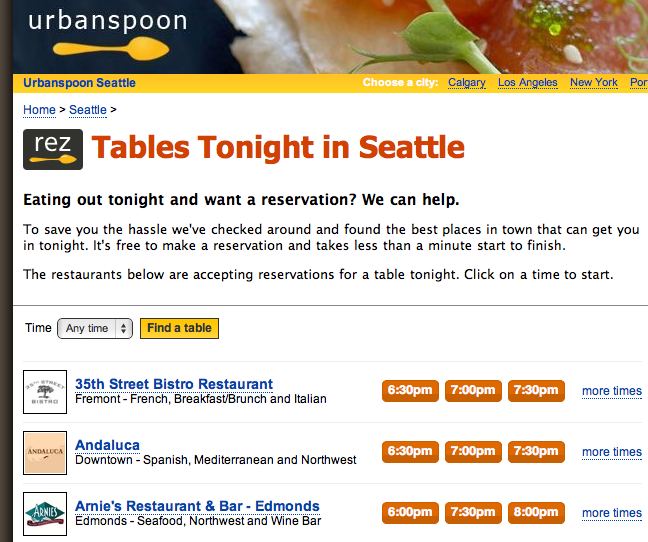 OpenTable is already responding in Seattle by trying to cut prices and being more aggressive from a sales standpoint. The bottom line is that this is a cheaper, simpler alternative to OpenTable, which the company will have to take seriously. It will probably force OpenTable to step up brand marketing and cut prices. If Rez gains visibility and “word of mouth credibility” among restaurant owners OpentTable’s growth may be slowed or stopped in some markets. Unofficially OpenTable has only about 10K restaurants across the US — a tiny subset of the entire population. Citysearch and Urbanspoon can bring a compelling set of related marketing services along with Rez, which OpenTable cannot. And Rez can become a more generic online booking/appointments system for Citysearch and InsiderPages over time, extending to other categories beyond restaurants. Now there’s an angle nobody else covered! 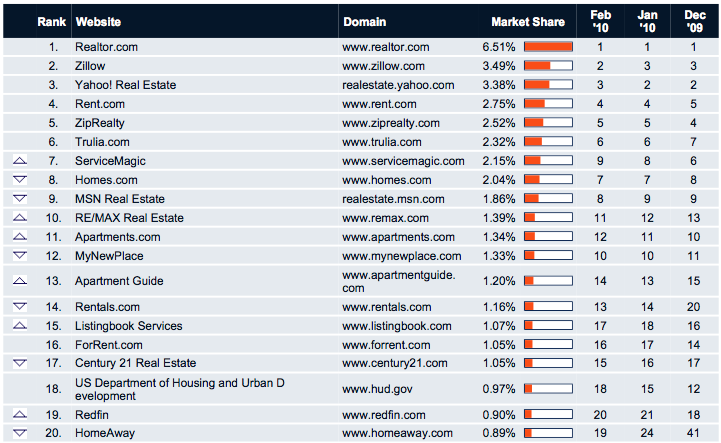 Trulia says that about 10% of its traffic comes from mobile devices. 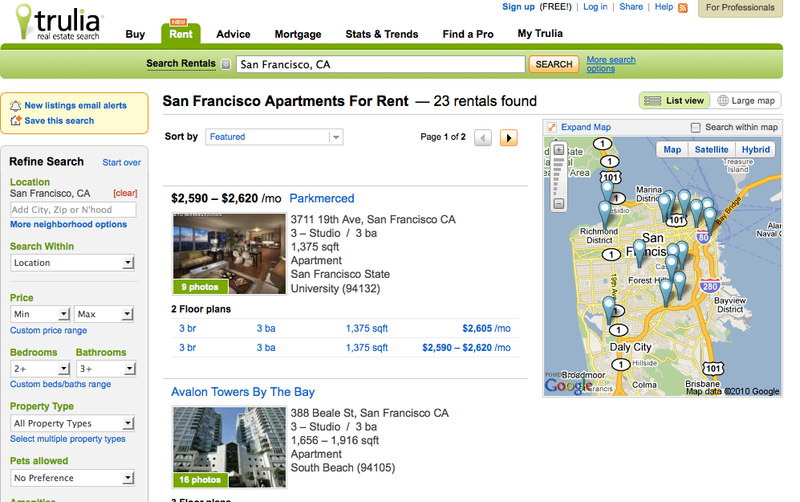 Zillow told me about the same number, spiking to 15% on weekends. Trulia recently added rental listings, which CEO Pete Flint said were even more likely to be searched on mobile devices in his view. But this is clearly not a case where mobile is cannibalizing traditional PC search behavior. It’s very much a complement to PC usage and an illustration of how local sites need to offer good mobile experiences — to deliver utility but also to cement loyalty. 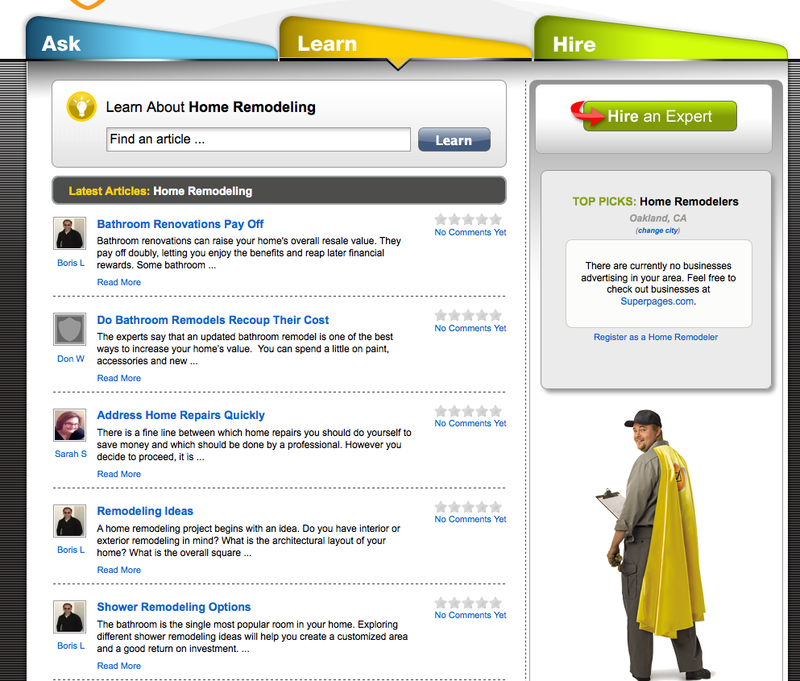 Hot on the heels of a recent agreement with Citysearch Dex One’s Business.com subsidiary has inked a deal with Yahoo! to help businesses achieve greater online exposure. Yahoo! 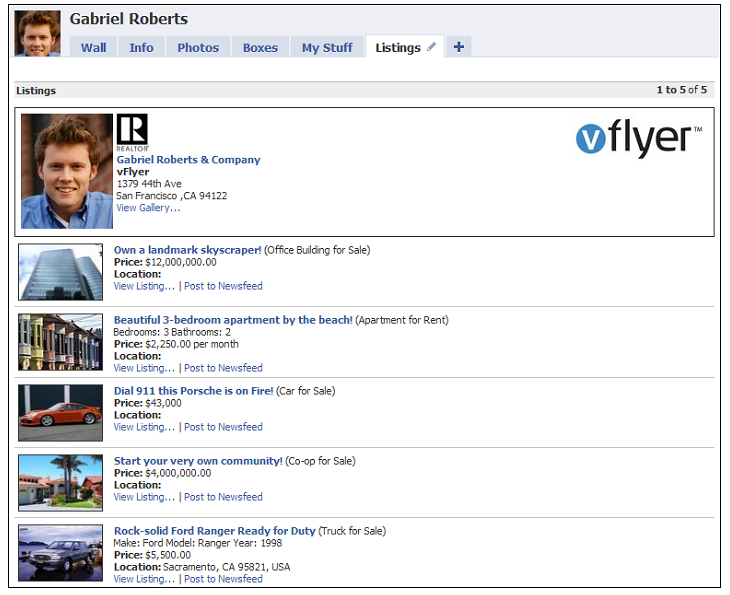 advertisers now have the opportunity to have their paid search ads appear on select sites within the extensive Business.com Network, providing them with expanded opportunities to reach online customers. Simultaneously, users who search on Business.com Network sites now have additional results to choose from, thereby helping them find more products, services and businesses that best suit their needs. Business.com claims 40 million uniques for its ad network, which contains a range of B2B sites such as Financial Times and AllBusiness.com. There’s some very targeted vertical exposure in these impressions/clicks. There are already lots of posts and articles discussing the update to Google’s UI this morning. 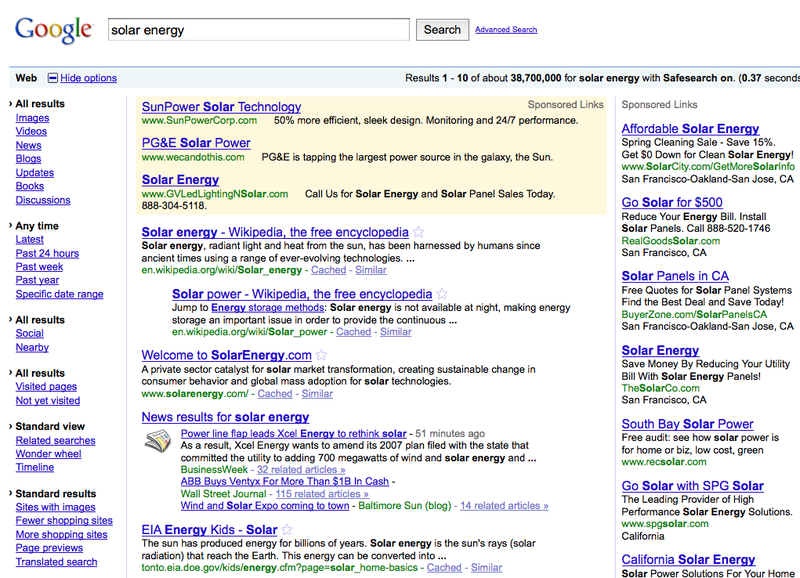 Preceded somewhat by the old Ask 3D, and more directly by Yahoo! 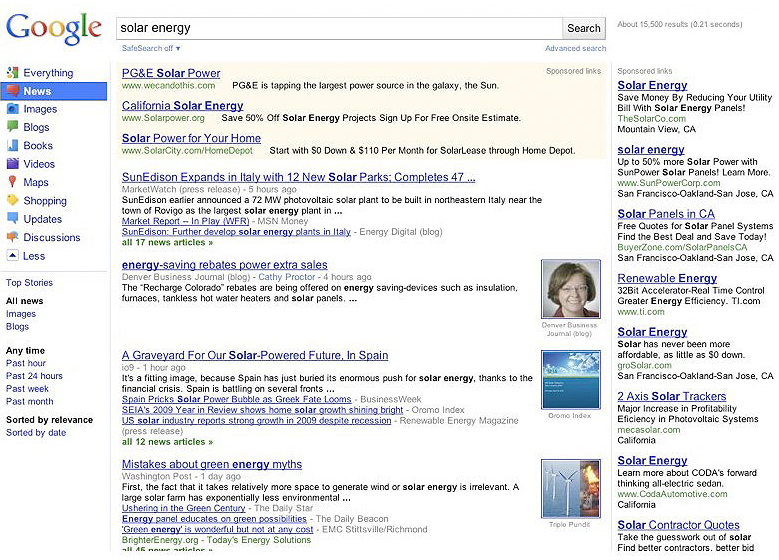 and Bing, Google is promoting a three-column format with various filters (search options) on the left. There are a dizzying array of options and tools there (previously text, now expanded and mostly graphical). Most of this is “power user” stuff. It comes out of “Universal Search” and is a successor strategy in a way to the blended organic content Google has been displaying in the body of search results. To my knowledge all that remains as it has been and won’t change. Danny Sullivan at SEL has a very complete discussion and roundup of all the new features. 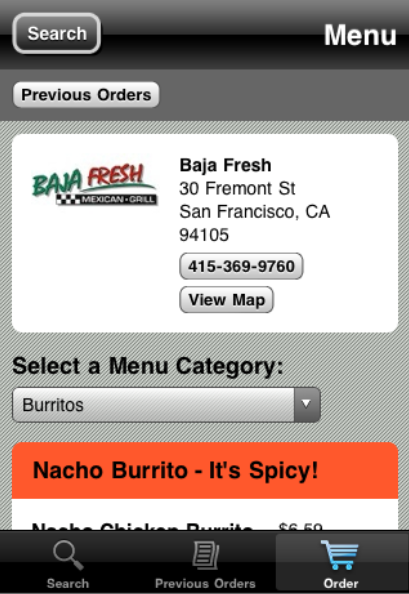 I’ve done a quick write up of the mobile version of all this at Internet2Go. But what about local? What are the local features here worth noting? Most prominently you can filter by “Maps.” Because I can’t see it yet on any of my machines, I’ll have to speculate that it simply takes you quickly into Local/Maps. There’s also the existing ability to sort by “nearby,” based on IP address or you can specify a custom location alternatively. Those have been part of the “search options” for a few months. If you sort by “shopping” you’ll eventually be able to get to local product inventory information. 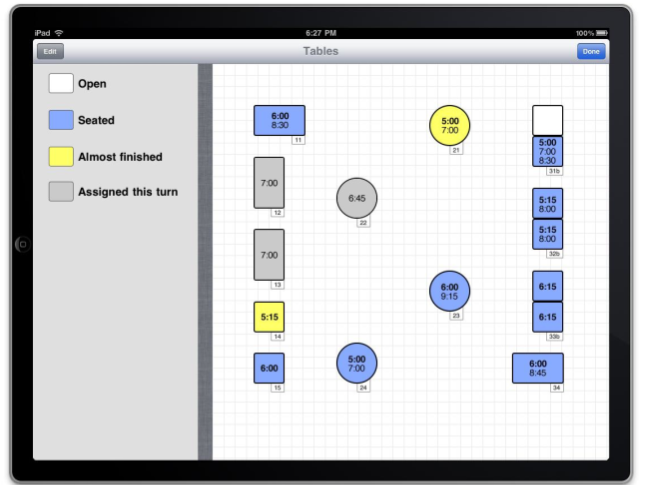 It currently exists in mobile for a small number of large retailers and will be coming to the PC. Some time ago Google changed the name of Maps to Local and back to Maps, citing consumer confusion over the idea of “Local.” However in mobile there’s a “Local” tab, which people “get.” In a way it would be better to have a Local icon/filter than a Maps icon. You could still have the maps icon at the top of the page. 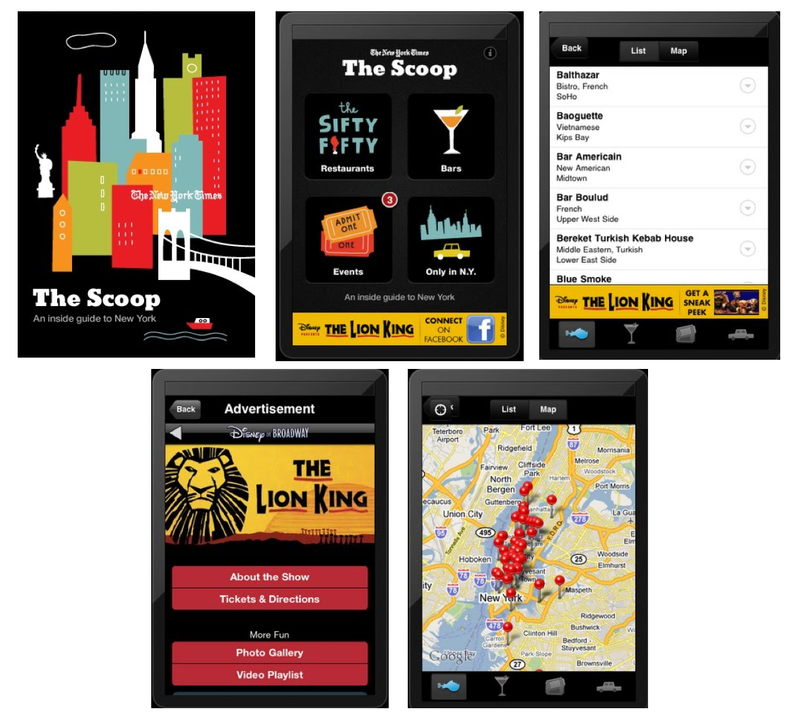 Local represents a broader sent of consumer intentions and use cases than Maps. However it would be problematic perhaps for Google to develop a new local filter. Local is really a “horizontal vertical” — a more “narrow” category than general search that also happens to be broader than any other vertical, because it contains most other verticals. How to best reflect and represent this in this new set of UI changes and filters is both a daunting challenge and right now something of a missed opportunity. 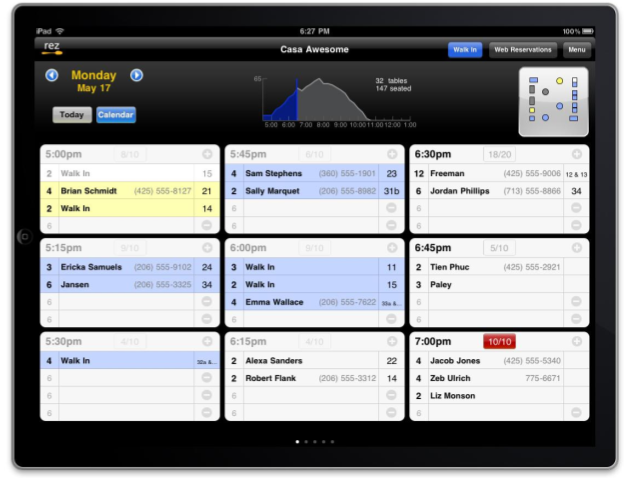 Earlier Roost introduced similar functionality. 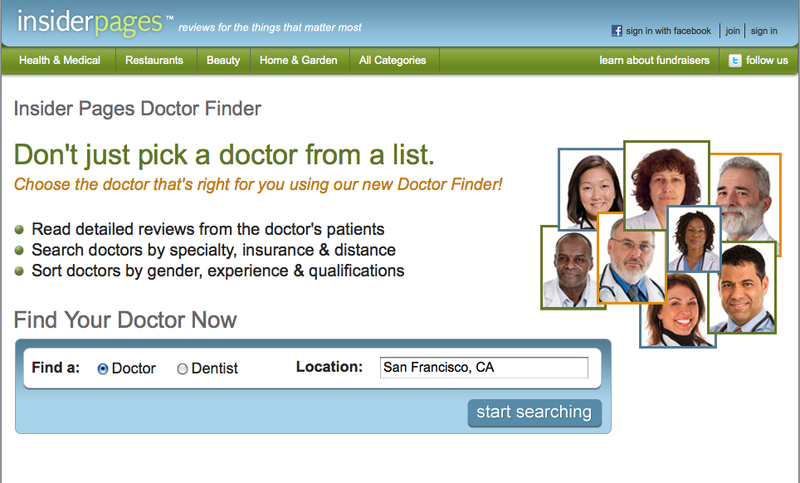 InsiderPages, which was purchased several years ago by Citysearch/IAC, just introduced reviews of doctors and dentists. It joins Angie’s List and ZocDoc in offering this information. There are a couple of smaller sites that do a version of this as well, including Ratemds.com. 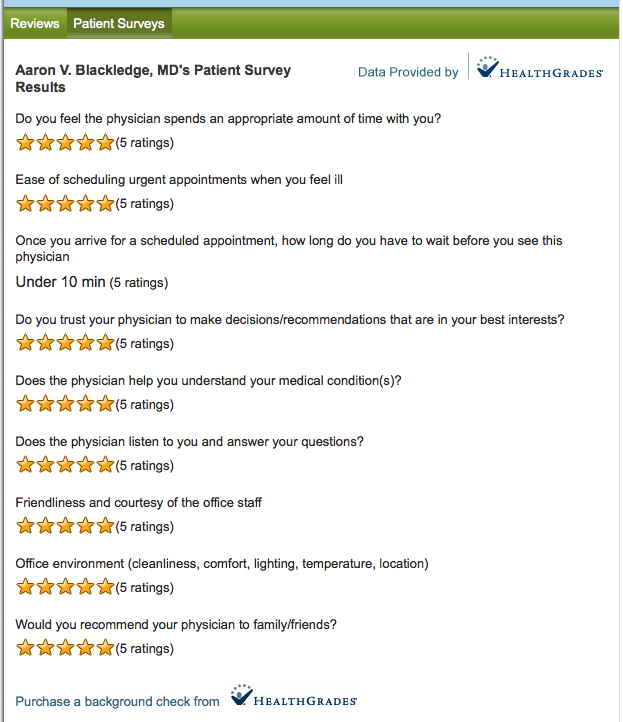 Angie’s List is a subscription-based model and ZocDoc doesn’t have the same national review coverage. ZocDoc does offer online appointment booking however. Most people today are forced to go to their carriers’ sites, which generally offer a bad user experience and little or no valuable information about the doctor or dentist him or herself. In addition to the insurance carrier filter, users can filter or sort by medical specialty, distance, gender, language, board certifications (and the all important “clean record”). 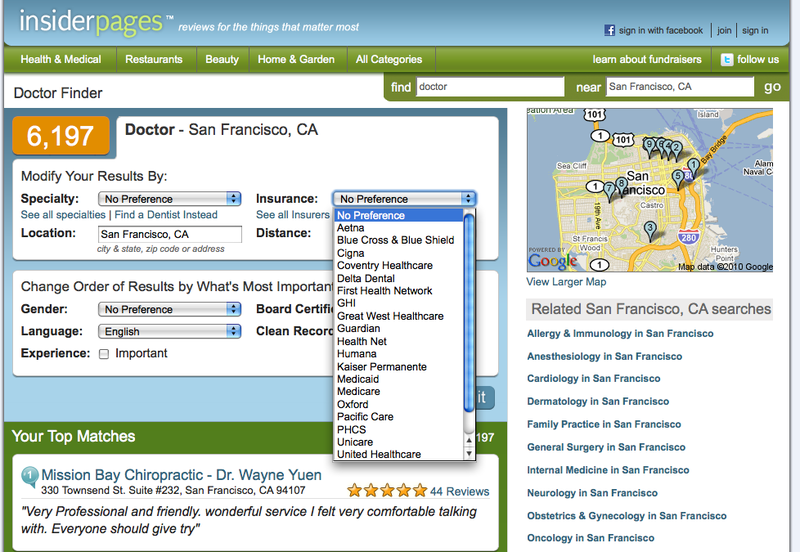 InsiderPages GM Eric Peacock told me that he thought they had reviews for roughly one-third of all doctors and dentists in the US, with higher coverage in major metros. When I spoke to Peacock yesterday it immediately struck me that this area would help define InsiderPages. He said that indeed doctor finder will become an area of emphasis and focus for the site, though it will still offer restaurant reviews and other categories. He also said that over time the business/ad model would probably move into lead-gen for the doctors and dentists on the site. 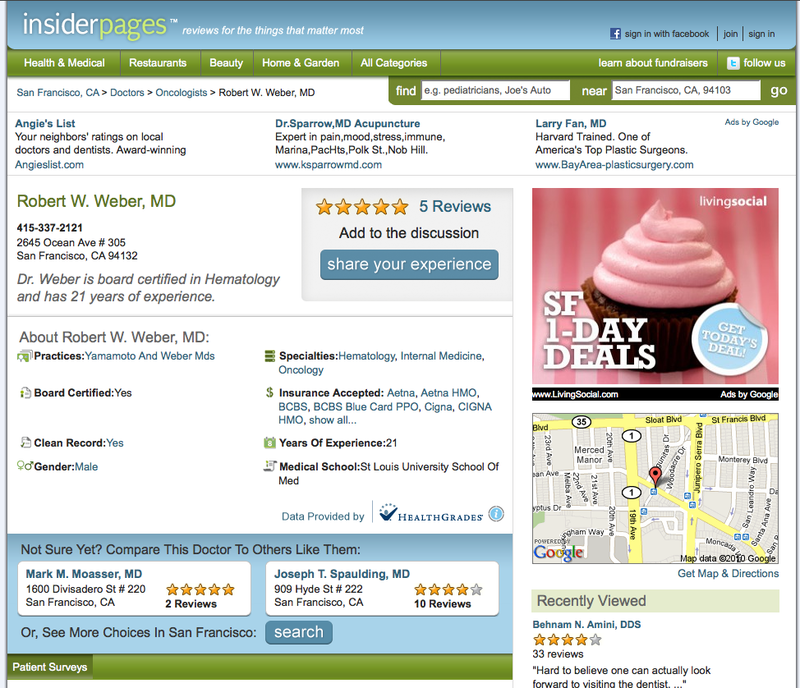 As a side note, InsiderPages is going to probably get a ton of SEO traffic here as they create pages like “Family Practice Doctors San Francisco.” This is an advantage that the site has over virtually all the competitors in this segment. 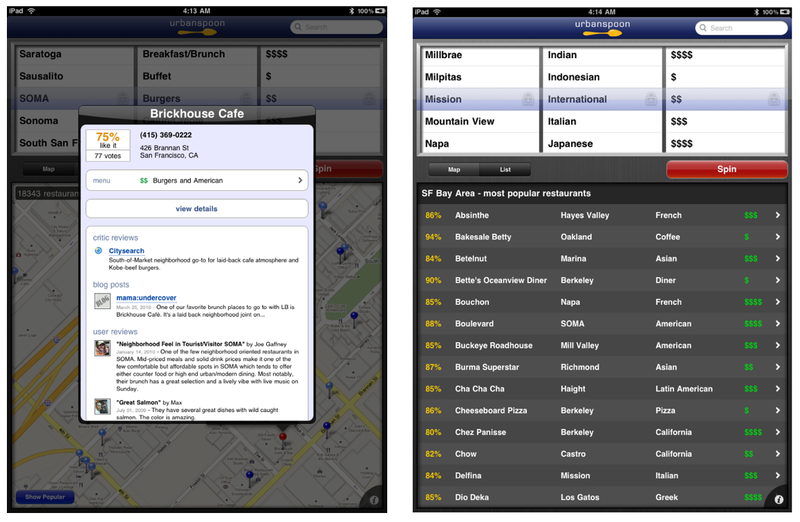 Urbanspoon’s new iPad app is the second entry on the new device from IAC/Citysearch. The first was the relatively undistinguished Cityseries app. But the Urbanspoon translation onto the iPad is a success. While there’s a good deal more that can be done with the larger “real estate,” Urbanspoon has made the leap well and may reap rewards from being early in on the iPad — as it was on the iPhone (Yelp, take note). 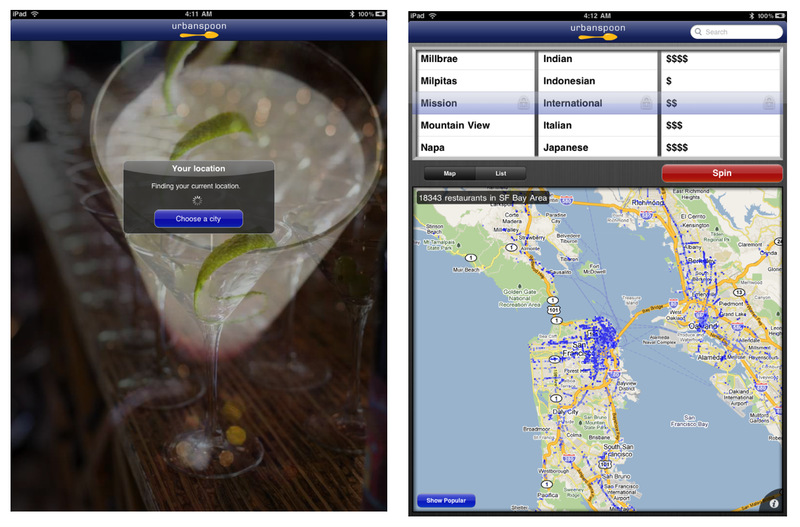 Whereas the iPhone app is all about the “slot machine” experience, the iPad app is all about the map. The same carousel functionality exists here but it’s more discretely up at the top of the screen. In general I find more “utility” here than on the iPhone version. And, as I said, there’s more than can be done with things like filters, favorites and neighborhoods. 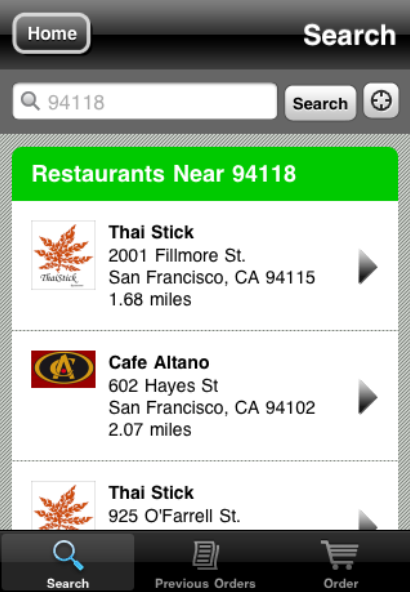 For those that don’t have an iPad (yet), here’s a video of the new Urbanspoon app in action. With Golden Data Will Facebook Push Local? Earlier this year at the Borrell local conference Yellowbook executive Pat Marshall made the remarkable statement that the site was getting more traffic from Facebook than from Google. I never was able to get complete clarity there or unpack the remark to fully understand it and the underlying data. But it’s symbolic of the growing importance of Facebook in the local ecosystem. Now with the advent of the Like button and Open Graph local publishers will race to integrate these tools. Indeed, they’ll make local sites more social and personal by showing friends’ activities and so on. They also provide a simple way for local businesses and the publishers to gain greater exposure to networks via Facebook. This was already true to varying degrees with Connect; the new tools merely amplify the effect. The potential “dark side” of all this is the fact that all the data that emerges from all the Like button clicking will be in Facebook’s hands. Other third parties in the network will be able to access some of that data with permission but no single party in the “Open Graph” ecosystem being created will have the entire data set — except Facebook. Facebook has given no indication that it will do anything like what I’m suggesting here, but let’s play out a scenario. They’ll know all these things in the aggregate and in terms of my network in particular. Each “Like” is a “vote” in the same way that each link is a “vote” in the SEO world. But a Like vote is much better than a link vote. In a very short period of time Facebook will have a ton of valuable data. What will do with all this data (courtesy of all the local sites that will implement Social Plug-ins)? It could do nothing in particular or it could build the single most effective local directory and search site that exists. This data will be more valuable than anything Google has or any individual local publisher-partner possesses. That includes Yelp, YPG or anyone else that joins the Open Graph and implements these new Facebook platform tools. Now let’s think back to Google a few years ago. Google was originally regarded mostly a source of SEO traffic to local sites. It had maps but it wasn’t considered the local competitor it is today. Over time Google continued to improve its local offering and started showing maps + local listings increasingly. It’s to the point now where local SEO is a very limited option. The need for alternative traffic is fueling the rise of CityGrid, the anti-Google. The story could well be the same with Facebook, should the company decide that local information is important to its users and/or that it wants to make local search a bigger part of the Facebook experience. One could also imagine a mobile app, “Facebook Likes,” that provides recommendations from my network and from Facebook users in the aggregate. The “coverage” on such an app would be unmatched because of the data that Facebook will be capturing — data that nobody else will have. Just like SEO in the past local publishers probably cannot afford not to participate in the Open Graph program. For them the benefits are clear and immediate. But in the long term the benefits to Facebook could be far greater. The question and uncertain thing is the degree to which Facebook wants to offer its own “local search” results or apps. No one at Facebook has given me any indication that they’re going to do something like this. It just popped into my head yesterday at the F8 event. And Facebook wouldn’t do anything for at least a year or two at the very earliest. However given the goldmine of data that will be coming from the Like button it will be very tempting to do something at some point. During the beta phase, leads will be sent to participating businesses at no charge. 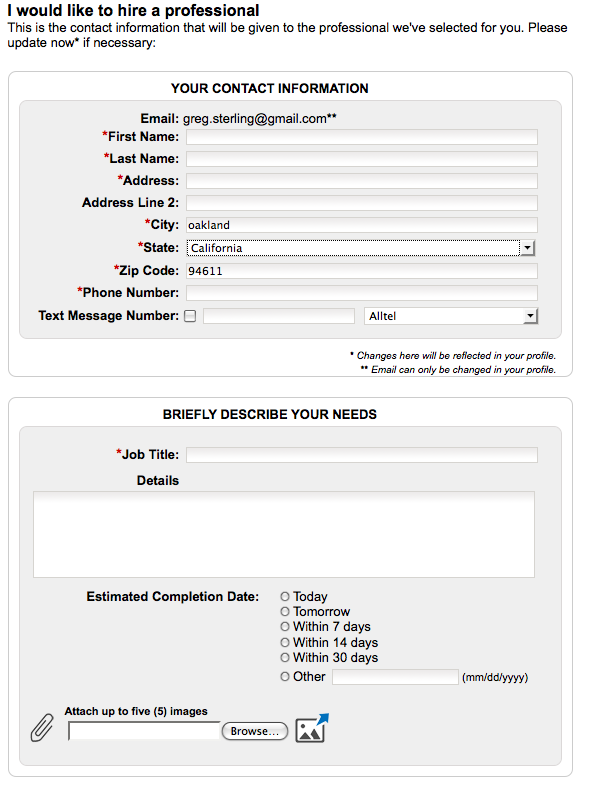 After official launch, businesses can purchase exclusive leads at a competitive market fee. Leads are only offered to one business at a time with information about the consumer’s needs so businesses can evaluate before deciding to accept that lead. Businesses are only charged for the lead if they decide to accept. The consumer’s contact information is only shared with the business once the lead has been accepted, which eliminates consumers being contacted by multiple businesses. During a call last week, I was cautioned by SuperMedia VP Robyn Rose that the sites are a work in progress and in beta. 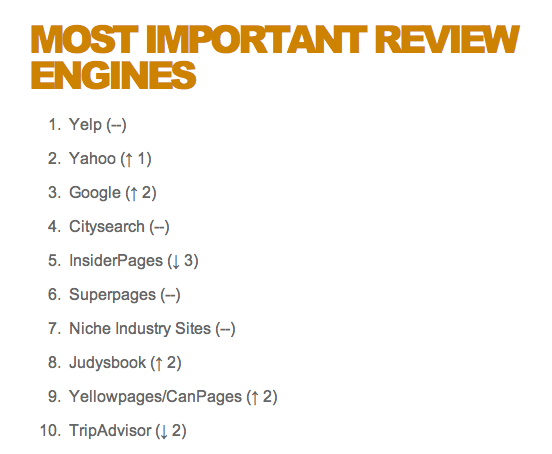 The initial three categories were chosen because they’re popular on Superpages and involve varying degrees of research and consideration. SuperMedia is trying to learn from consumer and SMB interaction with them whether and how to modify the sites before proceeding with a larger rollout. Conceptually this is very creative and interesting and trying to go beyond and provide more utility than the typical profile page details and content that are common to directories. There’s also broad SEO potential here in the Ask and Learn categories. The sites will also gain exposure on Superpages.com and vice versa. 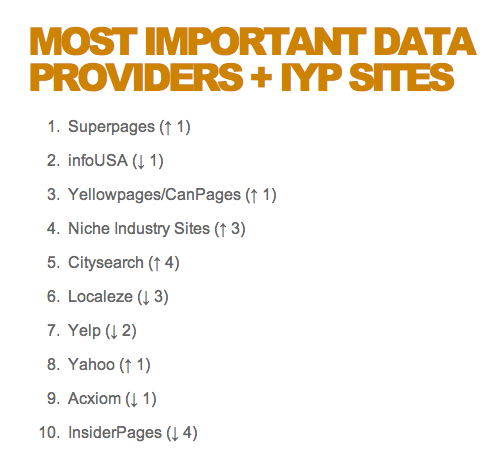 Taking a broader view, the changes and new efforts at Dex, Yellowpages.com and now SuperMedia reflect a time of transition and change in the US directory industry. The local market is now incredibly dynamic and competitive (as it extends into mobile) and these efforts are new attempts to bring more content, relevance and value to consumers and advertisers. In the case of SuperMedia, in addition to its various syndication programs, this vertical strategy is an effort to not only provide a useful consumer experience but also something of a hedge against reliance on a single consumer destination. What do you think of this new vertical approach? 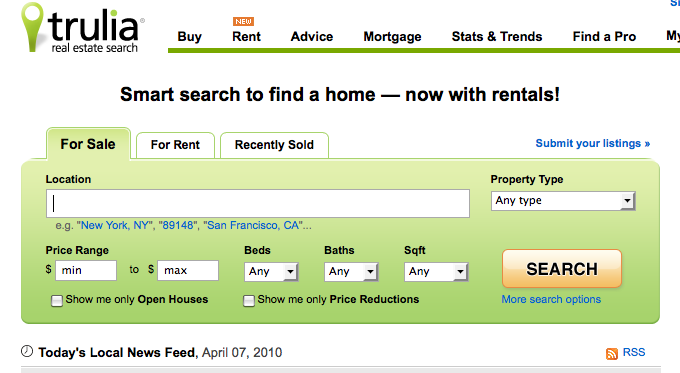 Trulia, like some of its competitors (e.g., Zillow), has branched into rental property search, the company announced today. This is a response to changes in the market. 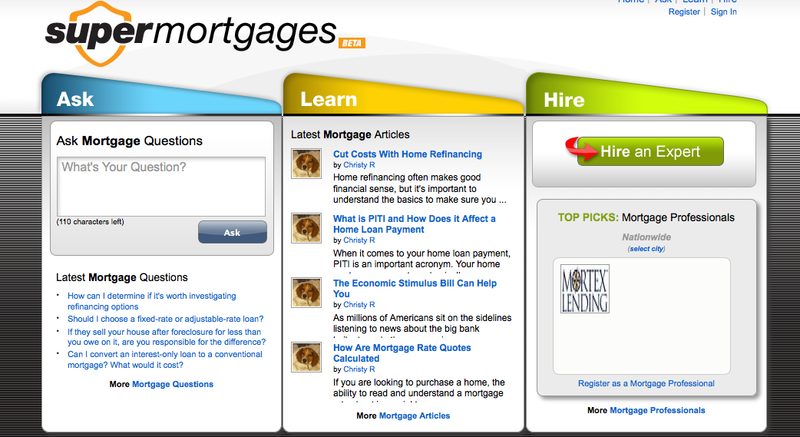 According to Trulia CEO Pete Flint approximately 30% of those in the market are equally looking at buying and renting. Flint told me that the rental data on Trulia are coming directly from brokers/agents, aggregators and a range of other sources. 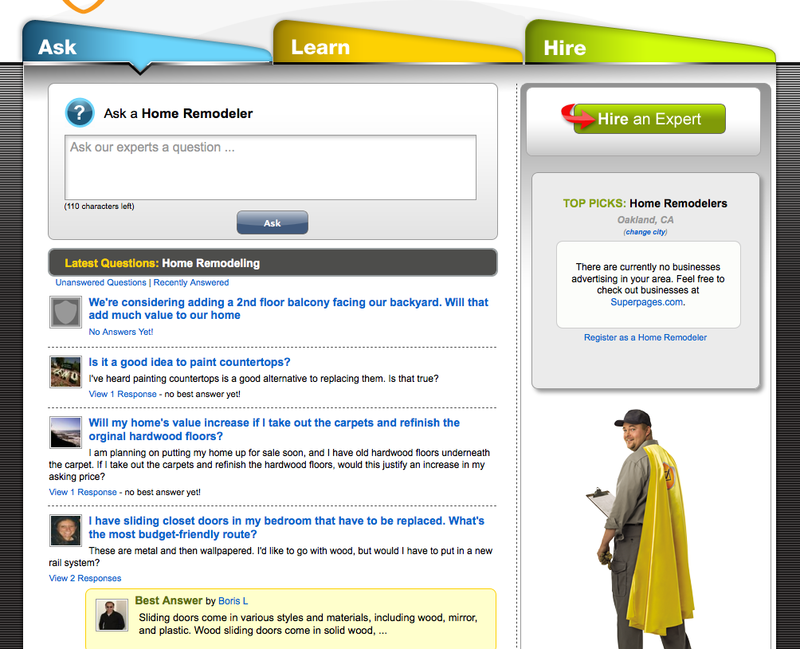 He said that anyone can add a rental listing for free. 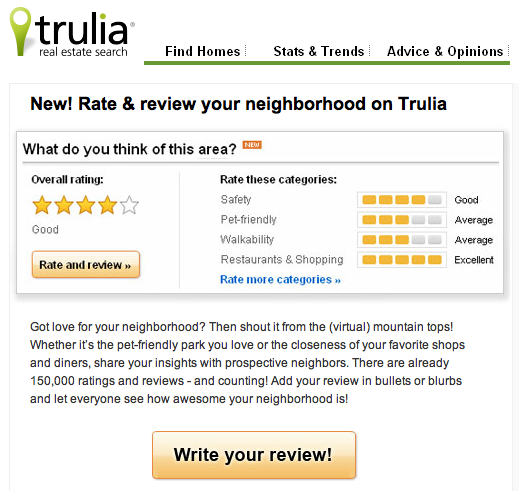 Flint asserts that Trulia’s rental database is more comprehensive than any other rental property site online. He also said the company’s search functionality and filters allow for a wide range of searches and lookups than competitors’ sites. Listings can also be shared on Facebook. There will also be an updated mobile website that is optimized for the iPhone and other smartphones featuring the rental search capabilities and listings. 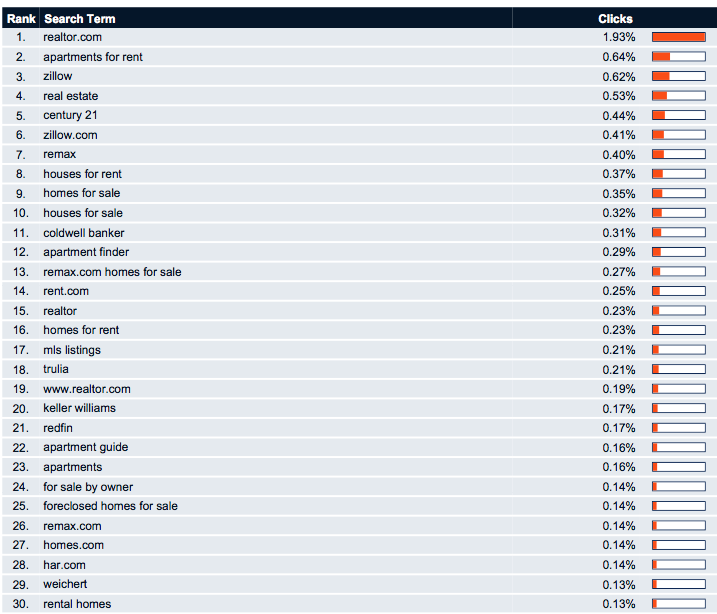 Flint told me that he sees the rental market as even more suited to mobile than the for sale market. That’s because “it’s a less considered purchase . . . and the inventory is more perishable,” according to Flint. 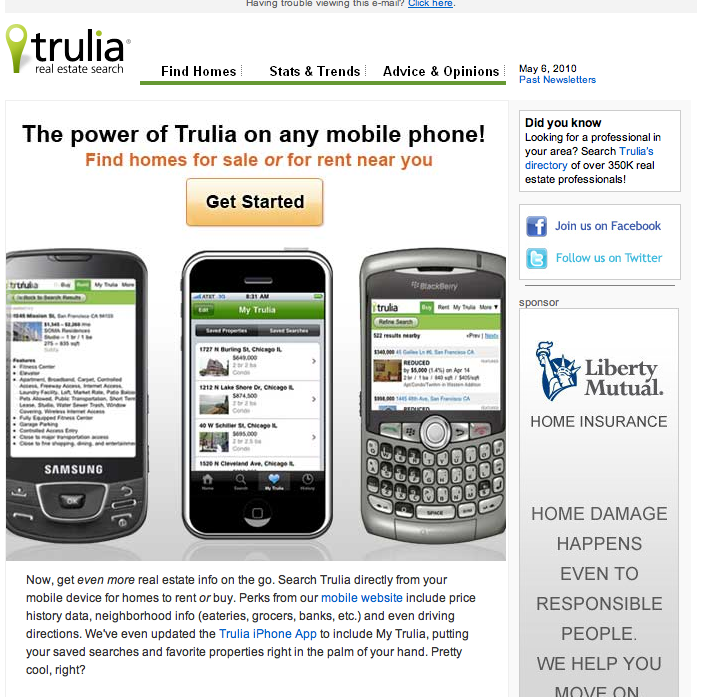 He added that roughly 10% of all Trulia’s page views are now coming from mobile devices.